Never smile at a crocodile! No, you can’t get friendly with a crocodile. FACT | "MASTERS"
Posted on October 4, 2015 by Mark and Sarah - MASTERS! MARK: What do you think of when you think of Nepal? Mount Everest, the earthquake, perhaps hippy Kathmandu. Bet you don’t think of crocodiles, rhinos and elephants! 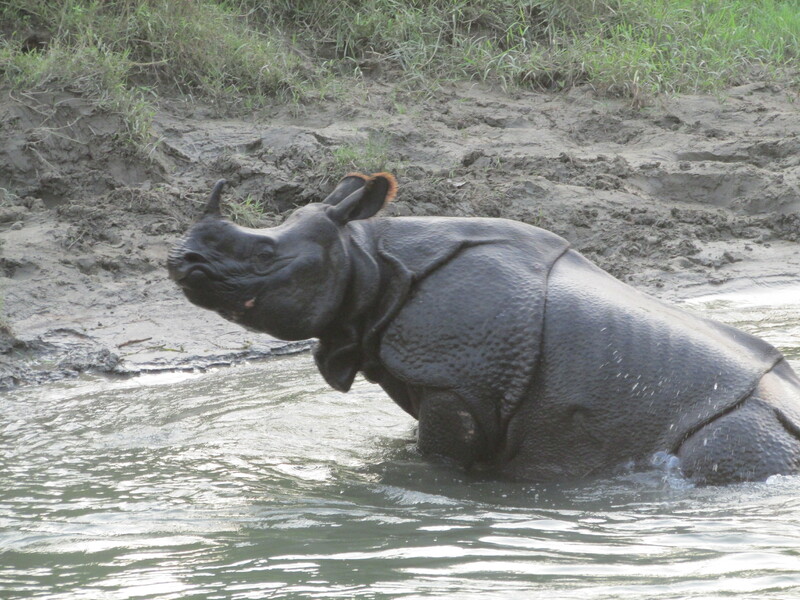 But these are just some of the animals we saw on our three day trip down to the Chitwan National Park, which sits on a tributary of the River Ganges, close to the north east Indian border. The awful, six hour, white knuckle bus ride from Kathmandu was certainly worth it. 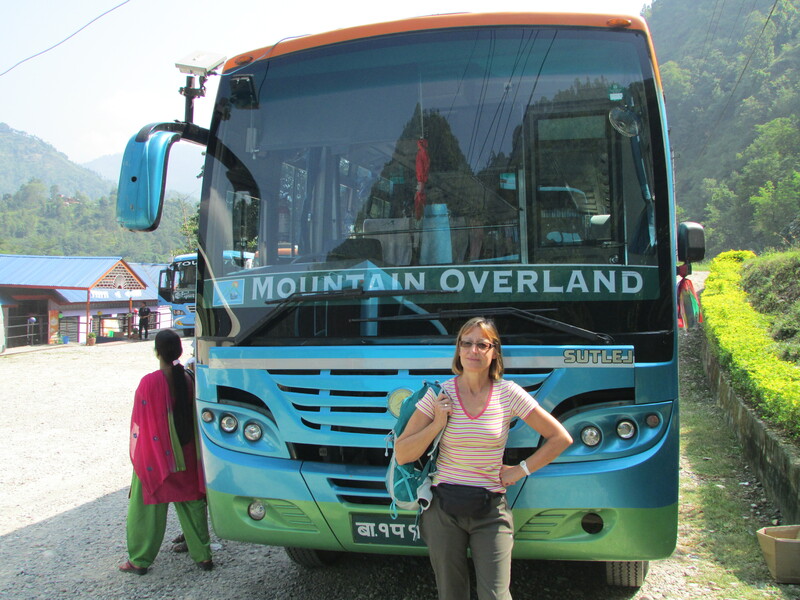 Just a 120 miles south-west as the crow flies, we were just grateful to get here as the bus driver on the Mountain Explorer, broke every traffic rule in the book and again, nearly had us heading, along with 30 Chinese nationals, head first in to a ravine. It seems road journeys here, as in India, are equally as bad. But the stunning view from our bedroom balcony over the Rapti River and beyond into the “Savannah” style grass was simply amazing. Our jungle guide Krishna (another one) was a mine of information and really passionate about everything he saw be it a red insect through to the two native species of crocodile. The first evening as the sun began to go down, he personally took us (as we were the only people in the 30 bedroomed Jungle Wildlife Camp) out along the river where we saw a giant rhino wallowing in mud, his armour-plating clear for all to see. 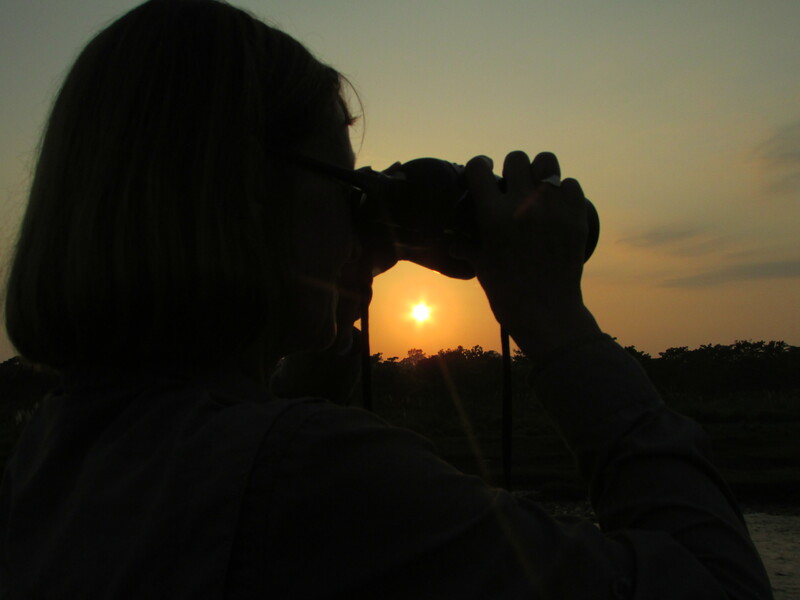 The Mozzies were biting as we headed west admiring the sunset as we went, Sarah scanning the horizon for predators through her binoculars, as sweat dripped down our North Face long sleeved shirts. I rarely sweat, Sarah never. But we did that night, with both shirts turning a darker shade, as salty water trickled down our bodies, arms and legs. 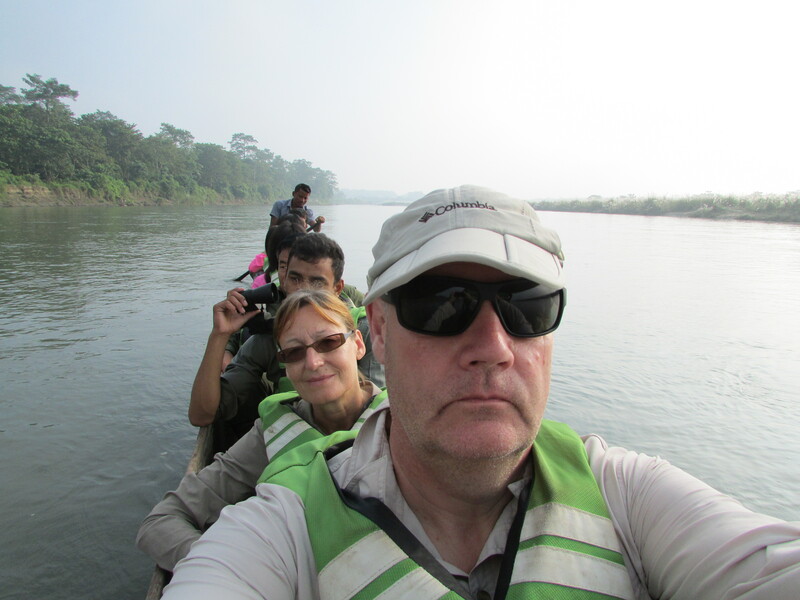 Next morning at 0645 we headed out along the riverbank, this time to join our jungle canoe. A hollowed out tree, was to be our home for the next hour as we were to glide down river, with the sun rising through the haze and riverside mist. All was going to plan, when suddenly we spied a giant Marsh Maga croc, no more than 10m away…. He looked at us, we stared at him and the three guides raised their sticks in case he attacked. He didn’t and our canoe continued its effortless down-stream journey getting deeper and deeper in to the steamy jungle. “Up there, on right” Krishna whispered in a loud hiss. “Like your bag.” I hadn’t a clue what he was on about. And then he shouts “Osprey”. He was right on both counts. 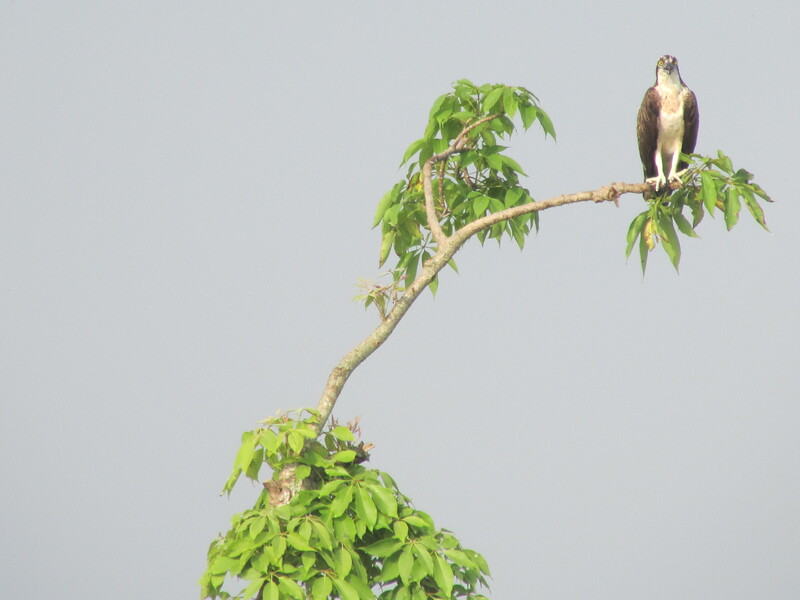 All of our four back packs are Osprey Bags and indeed it was a beautiful Osprey, sitting high on the branch surveying the river below, head swivelling from side to side. 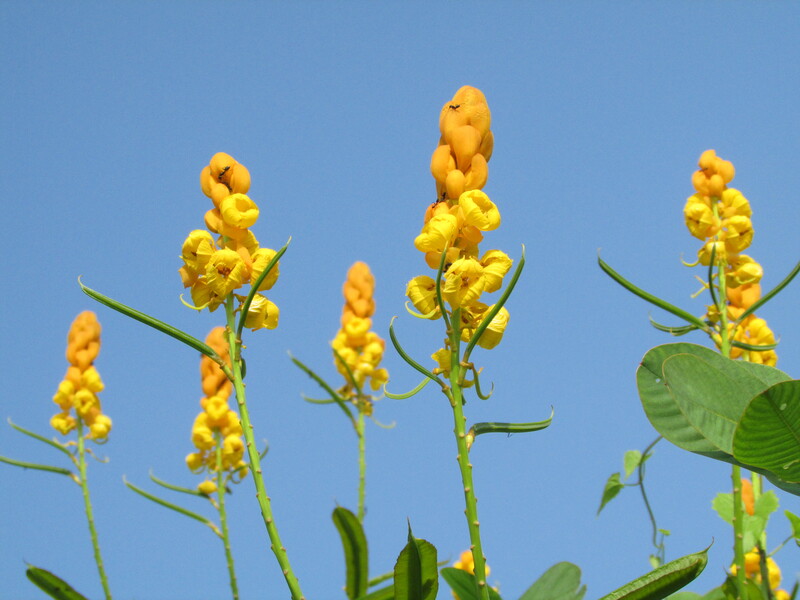 Beautiful, no big deal to the Nepalese, but a rare sight in the UK. Lucky omen? “Get ready for jungle” Krishna said to Sarah with a glint in his eye as the canoe came in to a sandy beach area, where hundreds of Sand Martins had made their nest. The underneath part of the boat made a shushing noise as we made land. We quickly jumped out and were all alone except for Krishna and his number 2 a local lad, there for protection from the wildlife. We were told what to do if approached by a rhino or tiger, with the last instruction being “run like hell and climb a tree” if all else fails! The jungle proper was about a mile away from the river, in between an expanse of tall grass and little else except these pretty orangey/yellowy bushes. All too soon, in the middle of the morning, our trek came to an end as a white jeep came in to view ready to take us back to base, time for a quick black tea and it was off to see the elephants having a bath. This took me right back to the Blue Peter Summer Expedition of 1973, when Val Singleton, John Noakes and Peter Purves went to Ceylon as it was. 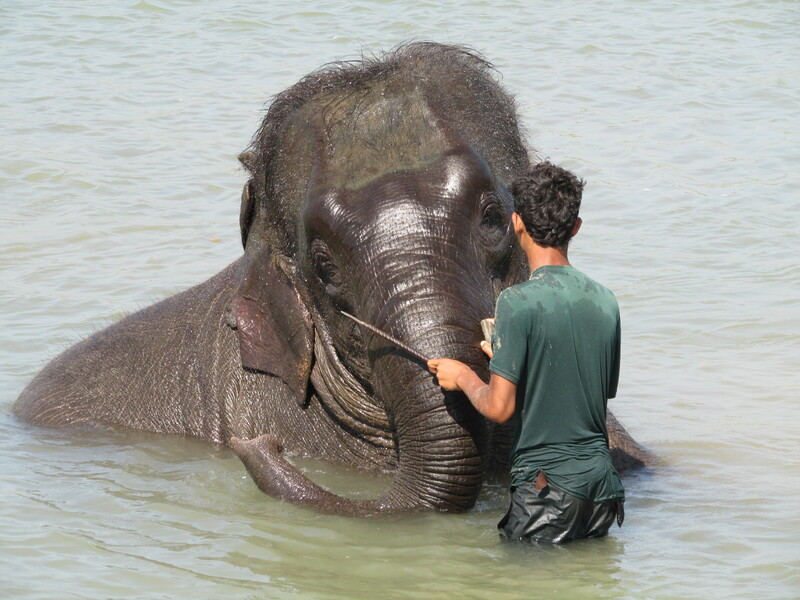 They washed the elephants and had a whale of a time. I’ve still got the Christmas Annual from that year complete with “Mini-moke” on the front cover. 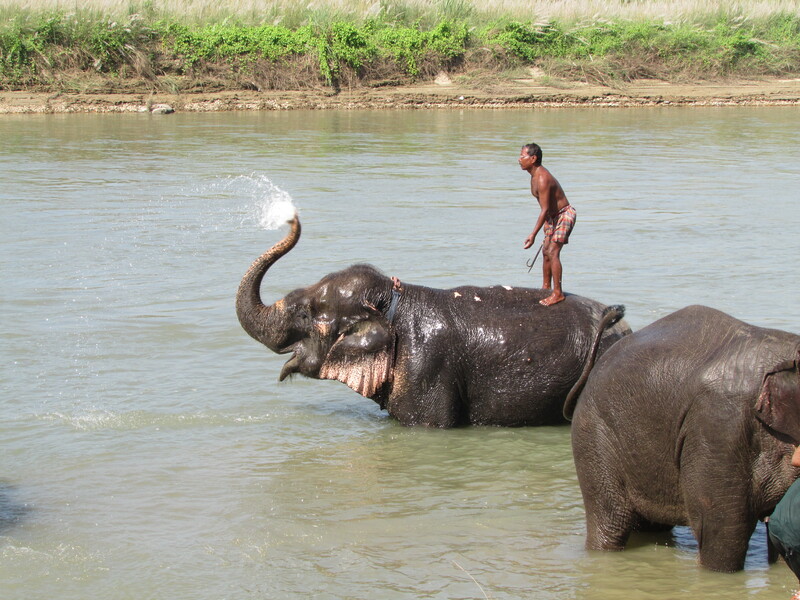 This time no Shep, but seeing wild and semi-wild elephants having a ball in the river with their handlers was amazing. Didn’t get in with them, but did go later on an elephant safari through another part of the jungle and saw Rhino with baby. But the final note must go to two people. I’ve mentioned Krishna before. One of life’s nice guys and a really good ranger. And then the man who looked after us so well at the Jungle Wildlife Camp. His name was Sitaram, a true hospitality professional and who at the end said to me “I meet many many guests, but not like you…. !” I’ll take that as a compliment then Sitaram! So if you are ever thinking of coming to Nepal, you must make a visit to Chitwan and you must stay at the JWC. 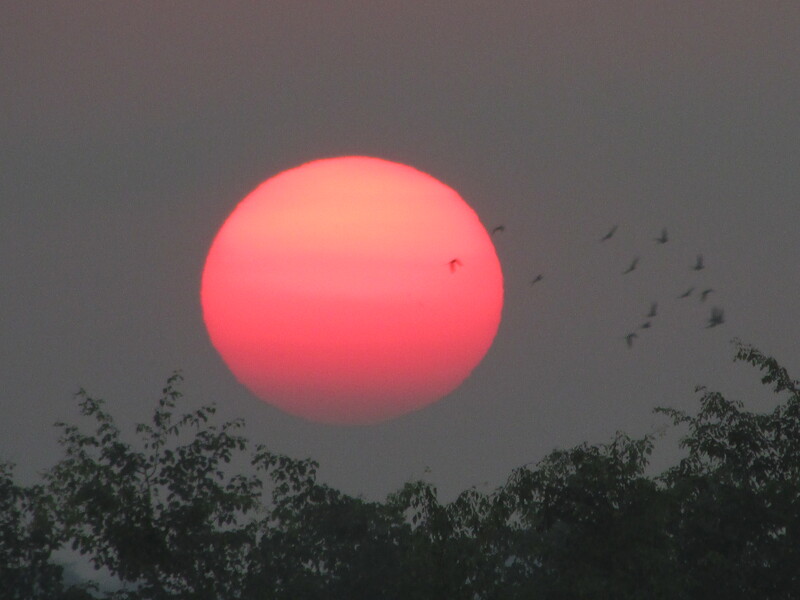 Thanks to Krishna, Sitaram and the rest of the gang – where else would you get a better sunset than this and be able to watch crocs, rhinos and snakes from your balcony sipping a cool beer? 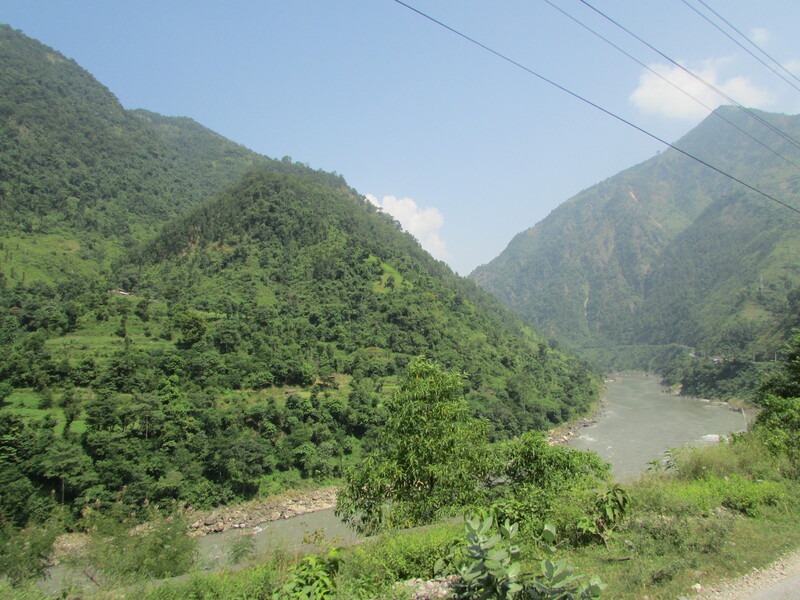 Off now to the mountains near Pokhara and then a special last minute treat, a flight over Mt Everest, weather permitting. Don’t forget to try out Nepali Style Chicken Curry..
thanks Pat! Am off in search of said chicken in Pokhara right now – hope we find some. OK, forget the book, I’ll wait for the movie! Your brains are going to be so expanded with all the colours, events, stimulations they have had to take in, you may both well require bigger bodies on your return to support them. Talk about living the documentary. Forget Michael Palin, Stephen Fry and that rank amateur Rick Stein: give me “Masters, champions of the travelogue.”every time. Travel safe. Off home today, but at least we have your posts to look forward to as winter sets in. Totally stunning pics. 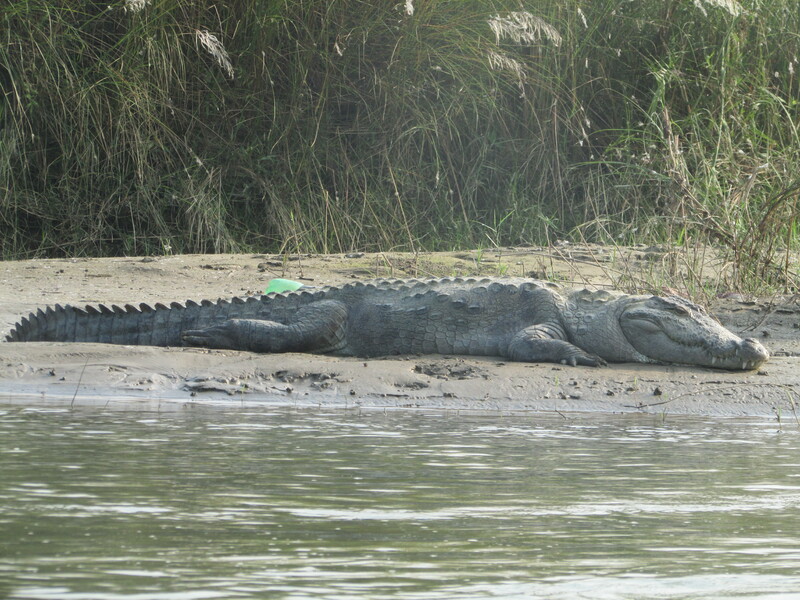 We remember seeing crocs on a river trip in India, but not quite so big!